Have you ever wanted to try your hand at oil painting? Perhaps you have experience in other forms of visual art; watercolour, acrylics, pastels, etc. For many people oil painting appears a mystery, technically difficult and only for ‘masters’. Yes, there are different methods of oil painting and techniques that need to be studied and practiced in order to achieve the desired results. However, I believe, most people can learn to oil paint. As with anything else, it’s all about learning and been shown by someone who has the experience. This is exactly how I learned to paint in oils. I was extremely fortunate to be taught, from the age of 10 years old, by my father, Fred Adams, who spent the majority of his life studying the techniques of the Old Masters, as well as being an art-restorer and picture framer. My father taught me ‘from the ground up’ (quite literally), starting with the basics of painting in monochrome, learning tonal value, then colour, etc. I also learned how to prepare canvases, prepare pigments, finish and frame paintings, etc. Now I have huge pleasure in sharing this knowledge with others. Even if you’ve never painted before, you can learn the first simple basics and produce your first painting. Or perhaps you’ve already had some experience, maybe with other mediums, and want to discover the techniques of working with oils. Whatever level of experience you have I can show you how to start with oils. 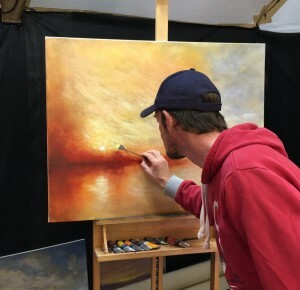 I offer individual and couples’ painting lessons and courses at my own Studio in Hevingham, Norfolk (around 10 miles North West from Norwich). One-Day Beginner, or Intermediate Courses: lasting around 6-hours I’ll take you on a journey of exploration in the art of Landscape Oil Painting, using the methods of classical fine art. This experience is offered to individuals, or couples. 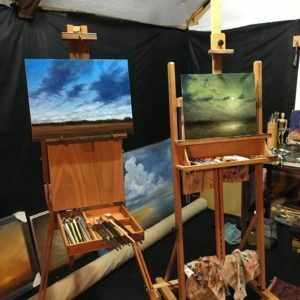 You’ll step into the space of a working artist and we’ll work together, learning simple but effective oil painting techniques and creating your first masterpiece! This painting tuition will focus on Landscape Painting (not portraits, animals or still-life) and I’ll share with you how to create a simple composition, using tone and colour. You’ll learn how to paint skies and sunsets, etc. As mentioned above, I’ll teach you some of the fundamental principles and technical skill that I learned from my father Fred Adams. The aim of this one-day session is for you to complete a finished oil painting and have a desire to go on and create more. These sessions are available on Fridays, Saturdays, Sundays and Mondays. Starts 10am, ends 4pm (approx). Parking available on site. Tea & Coffee provided, please bring a packed lunch. Gift Certificates are also available for this offer, so if you’d like to treat someone special with a unique gift please contact me to find out more. Please note; I only offer four studio sessions per month, so these are limited in availability. Also, due to restricted access, the studio may not be suitable for some people with disabilities. If you feel this may affect you please contact me and alternative arrangements can be discussed. PS. If you’d like to meet me first, visit the studio and just chat, you’re always very welcome. Please just contact me to arrange an appointment.